I nervously watched Wayne Thormeyer and Vello von der Lackiererei begin their track for the FH Championship at the GSDCA-WDA 2013 Nationals in Franklin, Tennessee. I had met Wayne and the contingent from Prairie State Dog Club earlier that morning. They were a great group and I had enjoyed passing the time with them while we waited for the tracks to age three hours and for our summons to the site. Vello was tracking beautifully and it was great to watch. My dog, Ivy von den Oher Tannen, and I had posted an excellent score of 96 thirty minutes before. The K-9 officer who was the track layer had marveled at the calm way she had worked. I had been pretty confident that hers was a wining performance, but this was looking to be very close. Since I could hardly wish ill on another competitor – in tracking, the competition is really the track and what ever Mother Nature dishes out right then – I reflected on the crazy turn of events that had brought us to the Nationals. I wrote about my training journey with Ivy, my “estate” dog last year for this magazine. Initially I had just wanted to get an IPO 1 on Ivy so that she could be breed surveyed. Along the way, I became hooked on this crazy sport. By early Spring 2012, Ivy was able to do an IPO 1 obedience routine satisfactorily, if not enthusiastically. Her protection was great some days, and shaky on others. Her tracking, however, kept getting better. I had read “How to Achieve Precision Tracking with Your Dog” by Kris Kotsopoulos which gave me greater insight into how a dog works a scent. It is a further refinement of the methodology developed by Gene English, which is the approach my trainer, Montell Brown, uses. In May, Nadia Adams, Ivy’s breeder, asked me to work with a young dog she thought had great potential. Portia was over the top in drive. After a few weeks, I knew that she would be my IPO dog. Ivy still went with me to training, but her lack of enthusiasm for obedience was frustrating. Montell suggested we work on an FH with Ivy. I knew this would be a great goal for this highly intelligent dog. Tracking can be the most maddening part of IPO. Championships are often lost on the tracking field. Part of the difficulty is the time and land required to properly execute a track. This is compounded with an FH as it is twice as long as an IPO 3 track and must age for 3 three hours and have a different track layer put in two cross tracks 30 minutes before the dog runs it. Additionally, we humans don’t fully understand how a dog breaks down scent and can’t really grasp how powerful a canine’s nose is. We know what we want the dog to look like on the track, so we concentrate on getting that picture while trying to teach something the dog does naturally and we can’t fathom. Meanwhile, the dog may not totally understand that the job is to go find the little articles that smell like the dude on the scent pad. It can be tricky! Tracking can also be the most rewarding part of IPO. It is a true test of the team’s bond. The routine is always the same in the other phases, but the track can be laid in one of many patterns. The dog must figure it out on his own and the handler must trust his ability. The only information the dog receives from the handler is what comes down that 10 meter leash. The dog can’t read the handler’s body as he does in the other phases. The handler must trust the dog, which isn’t always easy for the control freaks attracted to IPO! Ultimately the dog must be in charge with the handler just encouraging and occasionally checking his enthusiasm. This is the essence of the man-dog relationship from the first time a wolf edged nearer a camp fire: superior tracking skills in exchange for better living conditions. With all the modern detection devices man has developed since that time, the scenting ability of a canine is still unmatched. It is why there are canine units. It took longer for us to find a trial offering an FH than it took Ivy to master the increased difficulty. 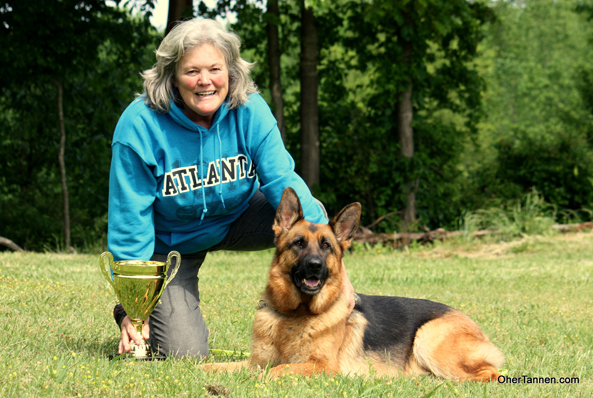 In March 2013, we entered Atlanta Schuthund Verein’s trial. When I took Ivy out for the temperament check and leash measure, I was hoping my nervousness would not bleed down the leash. Charlie Meszaros was completing his judge certification under Mike West and many of the top competitors in the Southeast were there as a tune up or qualifier for Nationals. It occurred to me that I might be a bit daft to attempt an FH as my first track at this trial! When it was finally our turn, we had to walk forever to the start. Ivy was walking in front, sniffing left and right as if tuning up her nose. I noticed a large crowd watching on the edge of the field. I had hoped the peanut gallery would not stick around … oh well. Once at the scent pad, I thought I faintly saw a track. I whispered “Such” and Ivy set off, veering slightly from my perceived track almost immediately. By the time she hit the end of the line, she was quite a bit to the left, but I had to trust my dog. It seemed like no time at all when she went down on the first article. On an FH, this must be at least 250 paces out. No way we had been that far! I was scared to look, but there was the article smack between her paws! After she nailed the first turn, I just settled in and marveled at her work. As she went down on the last article, I heard a roar from the crowd. Mike and Charlie both scored her at 98! Mike said, “that was a pleasure to watch, a real joy!” Ivy nudged the track layer with her nose – the GSD’s version of a fist bump. She seemed to be saying “I found you,” and it made us all laugh. Turns out my show dog is a real show boat. As we started our trek back to the car, Sigrid Riess-Mundry urged me to go to Nationals and Mike and Charlie quickly agreed. Jacob Pope, last year’s FH champion, also encouraged me. My husband overheard and it was settled! And here we were at Nationals. I joined in the clapping for Vello’s track. I was glad we had already gone! Regardless of the outcome, Wayne and I could each be very proud of our dogs. Doug Alexander, the judge, went over the track and finally announced “very good – 95.” On this particular day, Ivy had been a bit better. Ivy was the 2013 GSDCA-WDA Fährtenhund Champion.